The 47-year-old PGA Tour veteran won for the third time this year. Beating two players in a playoff. Perry now stands #2 on the 2008 money list, only behind Tiger Woods. Much has been made about Perry deciding to first skip US Open, and now the British Open. I’m of the opinion that the golf media really needs a life. Seldom has so much been written about so little. Since when has a ordinary player’s tournament scheduling been newsworthy? Tiger Woods is one thing, but I’ve been around long enough to have watched Jack Nicklaus, Tom Watson, and others and don’t recall their decisions to play or not play a tournament dissected. *- Lee Trevino chose to skip the Masters three times in spite of him being eligible to play. It may be 4, but in 1977 Trevino had back problems. That may account for him missing the tournament. *- 1967 PGA Champion Don January refused to play the 1970 US Open at Hazeltine because of his dislike for the course. *- Twelve time tournament winner and 1984 Vardon Trophy winner Calvin Peete never played the British Open. *- Here’s the best comparasion to Perry. In 1969 Dave Hill, who won 13 times on tour, skipped that year’s British Open. Hill won 3 times in 1969, finished 2nd on the money list that year, was competing for a Ryder Cup spot(like Perry, and Hill made it as Kenny is likely to do), and took home the Vardon Trophy that year. In fact Hill only played once at the British Open. If I look some more, I’m sure to find players of like ability to Perry who skipped the British Open. Is that right? Eight top-10 finishes in Milwaukee. Wow. Well, then I can certainly understand why you’d stiff the world’s oldest major, and a Birkdale course where Arnold Palmer, Lee Trevino, Tom Watson and Johnny Miller won championships. And I’m just spitballing here, but maybe you’ve had those eight top-10s because, you know, the world’s best players ARE AT THE BRITISH OPEN! Let me fire a cannonball back at the careless and unoriginal Mr. Wojciechowski. How many times have the Milwaukee and British Opens been played the same week since Kenny Perry turned pro, not counting this year? Once, in 2007. A simple check of golfobserver.com would have shown this. So 7 of Perry’s 8 top 10s at Milwaukee didn’t come alongside the British Open. If you’re going to play the same broken record Gene Wojciechowski, get your facts straight. Otherwise you look like a fool. Better yet, don’t write about golf at all. The left handed Stobbs came to the Major Leagues for the first time in 1947 and stayed around till 1961. He won over 100 games, but with a losing record. Mostly because he played most of his career with one of the worst teams(The Senators) in the American League. His one claim to fame or infamy, was giving up a 565 homerun to Mickey Mantle. My memories of Stobbs comes from my playing past seasons of Strat-O-Matic baseball. His luck in most of the games I recreated were no better than Stobbs was in real-life. RIP. SARASOTA â€” The Washington Senators were just playing out the string and it wasnâ€™t even his turn in the rotation, but left-hander Chuck Stobbs gamely took the ball for the 1957 season finale. Facing the indignity of suffering his 20th loss of the season, Stobbs battled the visiting Baltimore Orioles for 10 innings before dropping a 7-3 decision at Griffith Park. The fact that he cemented his spot in baseball lore that Sept. 27 day overshadowed Stobbsâ€™ competitive spirit. That same competitive spirit served the Sarasota resident well the last seven years as he battled cancer. Surrounded by friends and family, the 79-year-old Stobbs succumbed to the disease early Friday morning. â€œWhat I will always remember is that he didnâ€™t complain once during the last seven years,â€ Stobbsâ€™ son, Charley, said. Born in Wheeling W.Va., on July 2, 1929, Stobbs attended one year of high school in Vero Beach before his family moved to Norfolk, Va. He starred in football, basketball and baseball at Norfolkâ€™s Granby High School. He was later recognized by the Granby High School Hall of Fame and the Virginia Sports Hall of Fame. The Virginian-Pilot newspaper named Stobbs as one of the Tidewater-areaâ€™s greatest athletes of the 20th century. against the Chicago White Sox at Fenway Park. Stobbs was the youngest player in the majors during the 1947 season and the youngest player in the American League in 1948. The legendary Ted Williams once took the youngster along on a clothing shopping spree in New York City. After compiling a record of 33-23 in five seasons with the Red Sox, he was dealt to the White Sox on Nov. 13, 1951. Following the 1952 season, the White Sox traded Stobbs to the Washington Senators. Stobbs was credited with throwing the longest wild pitch in history during the 1956 season. The pitch reportedly traveled into the 17th row in the grandstand. Stobbs joined the St. Louis Cardinals after being released in July 1958 by the Senators. The Cardinals released Stobbs in the offseason and he rejoined the Senators, staying with the organization through its first season as the Minnesota Twins in 1961. Steelers Chairman Dan Rooney, the eldest of the brothers, wants to consolidate his control through a 10-year plan to buy out most of their shares, but a well-funded prospective buyer has emerged after some of Mr. Rooney’s brothers and their children raised questions about his offer. Stanley Druckenmiller, billionaire chairman of Pittsburgh’s Duquesne Capital Management, has expressed interest in acquiring the Steelers, people briefed on the negotiations said. In a statement Monday, the Steelers said Mr. Rooney “wants to stay in the football business while some of his four brothers plan to get out of the [National Football League] and focus their business efforts on their racetracks and other interests.” The statement said that Mr. Rooney and his son, Steelers President Art Rooney II, are arranging a financing plan to buy the brothers’ shares in the team in order to continue substantial ownership of the franchise by the Rooneys. “I will do everything possible to work out a solution to ensure my father’s legacy of keeping the Steelers in the Rooney family and in Pittsburgh for at least another 75 years,” Dan Rooney said in the statement. Follow the link to a timeline of the Steelers franchise history as well as the valuations of recently sold sports franchises. America’s best sprinter will not run the 200 meters in the Beijing Olympics, another casualty of our stupid selection policy. Tyson Gay accelerated through the first curve. Then, he started flying. Not in the figurative sense, but in an all-too-real way â€” a shocking sprawl to the ground that cost America’s best sprinter an Olympic spot in the 200 meters and made him look like less than a sure thing, health-wise at least, with the Beijing Games five weeks away. Had this been gymnastics, or a number of other sports, an injury at trials wouldn’t have ended Gay’s chance to make the Olympics in that specific event. But USA Track and Field plays it straight â€” top three finishers at trials make the Olympics, no exceptions. It’s a black-and-white policy that most athletes accept, though it could end up costing the American team as much as Gay in Beijing. Gay is the defending world champion in the 100 and 200 meters. How about a system that combines multiple events? Say, the Olympic Trials, the World Championships, and one or two other major competitions? That way, a poorly timed fall, injury, or illness would be less likely to cost an individual an opportunity for which they’ve spent a lifetime training. And Team USA would be represented by the best athletes. He died in a auto accident late last night. If not for Kiel’s arrest for shipping cough medicine two years ago, I would most likely not even remember him. RIP. SAN DIEGO – Former Chargers safety Terrence Kiel was killed after he was thrown from a Chevy sedan he was driving, police said Saturday. Kiel, 27, was driving alone after leaving a party at about 10:15 Friday night when he hit a wall in San Diego’s upscale Scripps Ranch neighborhood and was thrown from the car, police Sgt. Alan Hayward said. Kiel was barely breathing when paramedics reached him and he died about an hour later, Hayward said. Friends had tried to keep Kiel from driving home from the party, Hayward said, and witnesses told police he appeared to be driving in the wrong direction when he crashed. Police would not know whether Kiel had been under the influence of drugs or alcohol until toxicology tests were performed, Hayward said. A second-round draft pick out of Texas A&M in 2003, Kiel played four years in the NFL from 2003-2006, all with the Chargers. In February 2007 he pleaded guilty to felony and misdemeanor drug charges for shipping prescription cough syrup to Texas, the most significant of several scrapes with the law. He was released by the team after his plea. She defeated her sister Serena for her seventh career grand slam title. WIMBLEDON, England – Venus Williams beat sister Serena 7-5, 6-4 Saturday for her fifth Wimbledon title and seventh Grand Slam championship. This was Venus’ first victory over her younger sibling in a Grand Slam final since the 2001 U.S. Open, and it evened their career record at 8-8. Venus came from 3-1 down in the first set to turn around the match, breaking Serena four times while dropping serve twice in a final that produced breathtaking tennis despite swirling wind. This was more than a matchup between siblings; it was a contest between two of the hardest-hitting, most athletic players in the world at the top of their game. Venus broke to finish the match in 1 hour, 51 minutes, with Serena hitting a backhand wide on the second match point. The sisters embraced at the net, and Venus kept her celebrations in check as she twirled and waved to the Centre Court crowd. Venus accepted the winner’s trophy â€” a sterling silver salver aptly named the Venus Rosewater dish â€” from the Duke of Kent. I rarely watch tennis, but tuned in for most of today’s final. It was a good match, but probably won’t lead to my watching the men’s final tomorrow. See the wife and I go to mass on Sunday morning, therefore I won’t be home for most of the broadcast. The last time I watched a men’s final in tennis was one of the Borg-McEnroe battles of the late 70′s or early 80′s. Rick Gosselin notes that we throw around the phrase “future Hall of Famer” way too easily when talking about NFL greats. I’m hearing “first-ballot Hall of Famer” plenty these days with the retirements of Brett Favre, Jonathan Ogden, Michael Strahan and Warren Sapp. I’m hearing “future Hall of Famer” with the retirements of Steve McNair and Bryant Young. The Class of 2013 could be pumped up even further if Junior Seau decides he’s through. The assumption is that the latest is always the greatest, so let’s rush all these guys into Canton. In Favre’s case, I’ll buy it. He retired as the game’s all-time leading passer with more completions, yards and touchdowns than any other quarterback in NFL history. Five years from now when he becomes eligible for Canton, Favre figures to still be atop all the passing lists. Those are the true first-ballot guys: Favre, Jerry Rice, Emmitt Smith â€“ players who pushed the bar so high it would take years for anyone to catch them statistically. All other “first-ballot” candidates are matters of opinion, which makes them all subject to debate. The natural argument would be that Strahan played the strong side, where a player generally has to fight through more traffic to get to the quarterback than a weakside pass rusher like Doleman.Â But that argument hasn’t helped Kevin Greene. He finished his career with 160 sacks in 228 career games at his strongside linebacker spot and also can’t get into the room for discussion.Â Both Doleman and Greene enter their fifth year of eligibility in 2009. 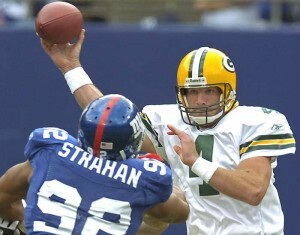 Both Doleman and Greene deserve discussion before Strahan. Derrick Thomas, Richard Dent and Charles Haley also belong in the queue ahead of Strahan. Warren Sapp was an all-decade tackle for the 1990s. So was Bryant Young. But so was Cortez Kennedy. Young went to five Pro Bowls, Sapp eight and Kennedy eight. Sapp was the NFL Defensive Player of the Year in 1999. So was Kennedy in 1992. Yet Kennedy has never been a finalist in his four years of eligibility. McNair took a team to the Super Bowl and was an NFL MVP. Ken Anderson also took a team to the Super Bowl and was an NFL MVP. Anderson went to twice as many Pro Bowls (four) than McNair (two). He also threw for more yards (32,838) and more touchdowns (197) than McNair (31,304 and 174). Anderson has been a finalist twice and been rejected twice. Jonathan Ogden went to 11 Pro Bowls. So did guard Randall McDaniel, who was bounced in his first trip to the finals last February. Junior Seau went to 12 Pro Bowls in his 18 NFL seasons. Les Richter played nine NFL seasons (1954-62) as a linebacker and went to eight Pro Bowls. He was once traded for 11 players. Yet he’s never been discussed by the Hall of Fame selection committee. Maxie Baughan went to nine Pro Bowls in the 1960s. He also has never been discussed. The latest doesn’t always translate into the greatest. Labeling any player a “future Hall of Famer” or “first-ballot Hall of Famer” is a disservice to those who have already earned their way into Canton with those designations. He’s right, of course.Â Some truly great players are not in the Hall and some of today’s perennial Pro Bowlers will surely fall short. The Pro Football Hall of Fame is by far the most exclusive of those representing the major sports.Â There are some truly mediocre players in Cooperstown.Â Basketball’s hall is, frankly, a joke, seeking to include everyone regardless of what level of competition they played at, lumping NBA greats in with women’s hoopstars and international stars.Â Â Golf’s hall is simply matter of “qualifying” by winning the requisite number of tournaments and, again, it includes those who excel on the women’s tour. Canton has gone, in my view, to the opposite extreme.Â Â A football team has 22 starters, not counting special teams, compared to nine in baseball and five in basketball.Â Yet, they let in a maximum of six modern era players each year.Â Baseball lets in anyone getting votes from 75 percent of the writers, allowing large classes if several greats retire in short order.Â Class sizes vary from year-to-year but typically three make it and as many as seven have in a single year.Â Again, in a sport with far fewer players. The Orioles have an awful record on Sundays. With Sunday’s come from ahead loss, the O’s have now dropped 12 straight Sunday games. Here’s the deal: If the Orioles win, all fans who attend the game get a complimentary ticket in the same seating category to any future non-prime game (there would be 33 of those during the rest of the schedule). The offer is good for paid tickets only to the July 6 game. If the O’s win, the ticket office will stay open after the game so that fans can get their free tickets. Redemption can be made through Aug. 31. The culprits are (regulars with sub .700 OPS) Jay Payton .637, Kevin Millar .479, Adam Jones .554, Ramon Hernandez .495, Melvin Mora .474 plus assorted shortstops. The pitching overall is fine with a 4.02 ERA in the daytime so far. The one exception is George Sherrill who is carrying a worrisome 9.39 ERA and has a WHIP of over 2 during the day. What’s going on? Could it be that these players need some sort of vision correction? Maybe the Orioles haven’t solved their daytime problem, but they did come up with a good promotion out of it.